We welcome this guest editorial from Michael Walsh. It is easy to forget that Roger Goodell is only the most powerful man in sports because the true oligarchy of power needs a public face. The inept, incompetent, and possibly unscrupulous Goodell only holds power because 32 of the richest men in America give it to him. And now, as the disgrace of the league’s handling of Ray Rice knocking his fiancée out cold grows larger and larger with each breaking news story and subsequent denial or “admission” of failure, calls for Goodell’s resignation are growing louder and louder, and not just from fans on Twitter, but from the league’s partner, and often times enabler, ESPN, as well as the National Organization of Women. Unfortunately, everyone has it wrong. Stop calling on Goodell to go. Start calling on his bosses to do the right thing and make him go. Make no mistake: Roger Goodell works for them. Those 32 insanely rich men. They have hired him to do their dirty work, protect “The Shield”, and most importantly, increase their bottom dollar. And boy has he. Just a few of those accomplishments include a CBA that grossly favors the owners, a new Thursday night game revenue stream, and local cities falling over themselves to let the taxpayers fund their stadiums. The NFL isn’t an ATM, it is a mint. They are printing money, and their stated goal is to grow and grow the game, and by that they simply mean to increase their profits to even more obscene levels. Goodell has been such an able employee, and just as importantly, been the face to take all the cries of hypocrisy and greed sent the NFL’s way, that they rewarded him with $44 million in salary last year. All of this to a commissioner whose gaffes and missteps are well-documented. High profile columnists, players both former and active, and fans on social media are happy to point them out. Ho hum. Print that money. Thank you Roger. You’re doing a great job. That is the message 32 of the richest men in America keep giving Roger Goodell. Well no more. That can no longer be the case. Not when the leader of the most powerful, richest sports league in America has so monumentally screwed up something so important. Ray Rice spit on his fiancée, twice, then hit her in the face with violent, malicious punches, twice, before dragging her like a sack of potatoes out of the elevator. And it is all on video. What Ray Rice did is despicable. How he has acted since then is despicable. Ray Rice may or may not be scum, but the evidence there is pretty overwhelming. And the NFL and Roger Goodell have enabled him and every other piece of scum out there. Domestic violence cannot be trivialized, it cannot be brushed aside, it cannot be explained away. The NFL owed it to every women in this country to do right by them, and they didn’t. Whether out of unimaginable incompetence, or, more likely, willful malice in trying to protect “The Shield” (their pocketbook), the NFL took what happened to a battered woman and made it an assault on all women. So it is time for one of the 32 richest men in America to stand up and be the first to say that the man they pay to do their bidding has to go. It is time for one of them to publicly, with his name attached and his face on camera, to say that Roger Goodell failed his biggest test, that he failed every fan of the league, every daughter, every mother, every sister, every wife and girlfriend, as well as every son, father, brother, husband and boyfriend that love and worry about those people being the next sack of potatoes on a videotape that people with power don’t care to watch. One owner needs to take the first step that will do whatever needs to be done to salvage something good out of all of this horribleness, no matter how much money it might cost 32 of the richest men in America. What is the price of right and wrong? Surely the job of one terrible commissioner isn’t enough, but it sure would help in making amends for the damage already done. Step up. One of you. Step up on your own and say he needs to go. The rest will follow. Then the league will go on, and hopefully the message will be sent that not only the behavior, but the enabling and incompetence that followed is not acceptable to the National Football League, and that women are valued and the league will go to any lengths to defend them from violent animals without having to worry about what 32 of the richest men in America might do to undermine that. Public outcry won’t be enough. When/if sponsors start pulling their ads and money, then we’ll see it. Callahan had my head spinning this morning, and from the sounds of it, Minihan’s too, with his defending of Goodell. I completely agree with your conclusion that the NFL needs to fire Goodell. I made that exact post on BSMW yesterday. Where I disagree with you slightly is your analysis that claims Goodell’s inactions on domestic violence were an attempt to protect the league from liability (you say protect the shield financially). If that were the case then Goodell’s response to Rice’s case of domestic violence should have been unique or out of the ordinary to have generated this much discussion once the video appeared. The real issue is that the NFL has NEVER considered domestic violence anything other than a distraction. There have been 7 domestic violence suspensions in the history of the NFL. The longest was the 3 games given Michael Pittman after it came out he had been involved in over 50 domestic violence incidents. USA Today has a nifty table showing the 713 incidents of reported domestic violence by NFL players since 2000. These 713 incidents, resulting in 84 arrests have generated 7 suspensions, only one for 3 games and the rest either 1 or 2. The cult of football with its violent traditions and animalistic traditions appeal to the alpha male’s pride. My assumption is the prevailing attitude in the league during and prior to Goodell has been: NFL players are not Boy Scouts. We pay them to perform violent acts every Sunday. When a few act up outside the game, lets just sweep it under the rug because teams need these players and their aggression every Sunday. Goodell needs to be fired. On that we agree. Where we disagree is why and who really is culpable. I think the owners and their macho attitude towards women and the world need to take a long hard look in the mirror. Some people mocked Myra Kraft for objecting to Christian Peters being cut. Others objected to Bob Kraft for being “henpecked” because his wife objected to the team drafting a guy who beat his girl friend publicly in college. Parcells was certainly annoyed and did not understand why Peters actions off the field should affect Parcells team on the field. Turns out she was right, while others were too busy turning a blind eye to a real epidemic and a culture that accepted this behavior. If anything good comes out of the Ray Rice fiasco it is that the next commissioner might not be tolerant of 713 incidents of domestic violence over the next 14 years. The commissioner should be seen during the first round of the NFL draft to announce each team’s pick; should be seen giving the “state of the NFL” address during Super Bowl week; and shoud be seen on the field presenting the Lombardi Trophy after the Super Bowl is over. There’s no reason for him to be seen or heard at any other time (other than through sanitized statements issued by the league’s PR office). Say what you will about Tagliabue, but he understood the job and he understood football. Goodell understands neither, and he never met a camera or microphone he wouldn’t seek out and try to dominate. That personality flaw has led him to make some very, very unwise moves and decisions during his tenure. And yes, I’m still very bitter about what he did to the Pats — and their reputation — over their misdemeanor and quite common offense 7 years ago; but, I’m convinced he did it for the reasons I cited earlier: he loves the camera and the limelight, and he just HAS to be involved with and micromanage EVERY situation. I really hope he doesn’t survive this Ray Rice thing. He has to go, and he’s needed to go for a long time IMO. The irony with Spygate is that Goodell made his name, first and foremost, with his ‘punishment’ from the video taping of signals. It might be a VHS tape that brings him down. I forget who said this, otherwise I’d credit them, but the irony is great. Unfortunately with Spygate, this will result in even more lunacy over it among the media and general populace, I’ve already heard Felger proclaim that this makes Spygate look even worse and even a non-troll like Bill Simmons has claimed that this will give more meat to the claims of Spygate “truthers”. Goodell’s trangressions this time are far worse, but in my eyes I’ve wanted him gone virtually since he became comissioner and it was only a matter of time before he brought something like this on himself. If you weren’t a Patriots fan, wouldn’t you have more questions, now, about Spygate? I ask because this whole thing, to me, brings into question every single “bigger” act of discipline Goodell has issued. I ask, as well, because as a Patriots fan, I wonder if what was on the tapes was not as bad as speculated. Jay Glazer claims to have a copy he shows at parties, which I’m inclined to believe because he tends to have alternative sources that exist beyond the wire that ESPN, NBC, etc are provided. He’s stated that 90% is cheerleaders and the bad 10% is the same stuff others were doing. Using this, Saints fans have an even bigger case because I thought they got railroaded due to the CTE/concussions stuff. The league wanted to make it seem like they cared about that stuff so they couldn’t have it come back later in court. Everything Goodell has done now makes me wonder. Unfortunately, as we’ve come to learn, which was previously suggested, nothing that could embarrass “The Shield” will ever be brought up, and they’ll try their best to clean anything up. Maybe Season 4 of Ray Donovan can have him heading NFL security. Let’s slow down a bit here and let the process take its course. We are relying on the reports of the very media this site is intended to “watch.” How many times have a media-driven lie become “something everyone knows?” Hello Duke LaCrosse team, meet the “white hispanic” George Zimmerman. They should have lunch in Ferguson, MO. The owners have every right to fire him for whatever reason. Remember that our source of information here–the media–is no longer “the news.” It is an agenda-driven narrative from all sides, whether it be Fox or the NY Times. It resembles the structure and arc of a soap opera. We see only the bits of red meat that they want to show their supporters. Basically, we choose to listen to those who tell us the lies we like to here. End of Sermon. The Duke lacrosse case wasn’t a media-driven lie — it was driven by the DISTRICT ATTORNEY for Durham. Who was disbarred, by the way, for his actions. The media ran with it without doing their own reporting or letting justice run it’s course. But Dave’s point is the media reported what they were fed by an obviously corrupt person in authority. Therefore the cases are not analogous. I would add to Dave’s point that the majority of what is reported is not falsified or done with hyperbole or sensationalism. In this case, Rice clearly hit his wife. The NFL and the Baltimore Ravens clearly had an agenda to either not investigate or not punish because Rice playing was more important than getting involved in a domestic abuse squabble. I have to disagree with you on this one. I feel the majority of what is put out there nowadays is hyperbole and sensationalism. I really wish the FCC never got rid of the Fairness Doctrine, so that we had more balanced reporting. As for the media reporting what they were fed by a corrupt authority, isn’t it their job to qualify and do their own reporting? Isn’t this what just got Peter King in trouble (to a much lesser degree of course). The media shouldn’t be reporting what they are being fed by anyone. I used to be a college professor in Boston, teaching European history. When it came to research and writing the two majors’ students who I had the hardest time with were Education majors and Journalism, although for different reasons. The Journalist approach to present a thesis, or argument, is narrative. That sounds good at first for history, but it is not. The narrative approach forces you to push along a story with a predetermined ending. The need for brevity forces you to eliminate any evidence that does not fit the narrative. Journalists don’t “lie” per se, but they are HIGHLY selective in what they choose to report. For example, after the Newtown Massacre, it was widely reported the the murder used his mother Bushmaster. No–he used pistols. The Bushmaster was left in the trunk. It was there, it was a part of the story, a portion of the truth. However, by removing that portion of the story it fit their large narrative of gun control. The historian’s approach (should) include those aspect. Most don’t anymore, which is ONE reason why I don’t teach anymore and run a construction company in NH! Sorry to use a non-sports analogy, and I don’t especially want to broaden the discussion in that area, but it is a story we’ve all heard. If you want another example, non-sports, just look at the local weather reports. “Storm Center” “Early Warning” and other reports that suggest that the world is gonna end with the next heavy weather. With the announcement of the Bob Mueller inquiry, the owners have some cover to delay any action. If the report is as bad as most think it should, he’ll be gone. But it could also find a fall guy like Greg Aiello. As this piece points out, this is mostly about money for the owners. But it’s also the reason Goodell won’t quit: there is no one who would pay him remotely near $44 million a year even before this latest imbroglio. They also now have time to work on his golden parachute. The NFL is lucky that they basically have partnerships with every major news outlet, even outside sports, ready to be their PR firms. That obviously changed when TMZ came coming with an ICBM. What’s been interesting to watch, on the media front, is that ESPN continues to hammer at Goodell and the NFL. Not only are columnists (usual suspects) calling for their resignation, but they seemed to unleash their regular news guys (Schefter, Mort, etc). In addition, OTL continues to investigate and find inconsistencies.The rest of the PR firms (NBC/CBS/etc.)? Crickets. Par for the course when they have an interest or affiliation, but still an interesting thing to watch. 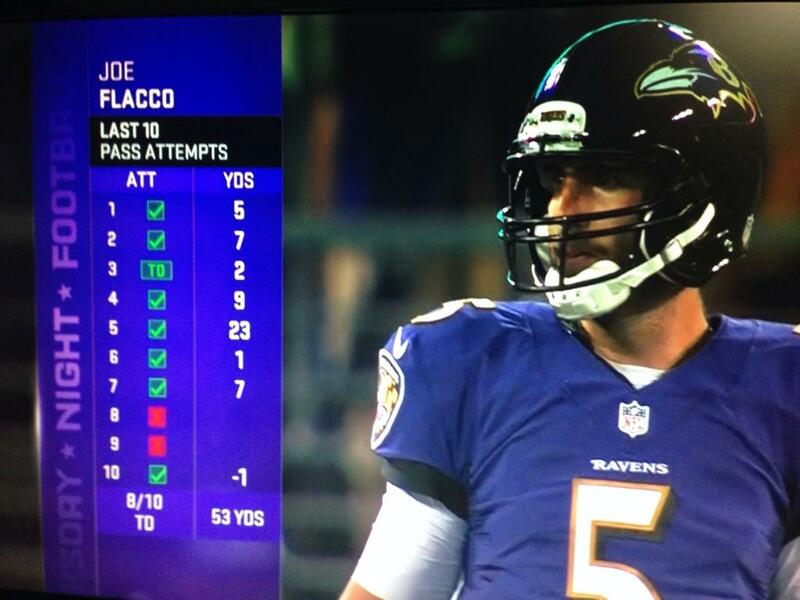 @MoveTheSticks That completion graphic looks like a mix between my to do list and my 4th grade report card. I missed it but your post articulates the point I was trying to make much better. And, yes Pats fans, because of Goodell’s utter incompetence in the Ray Rice saga, “Spygate” is now back in the news. Eric Wilbur, the complete moron whose continued employment by the Globe exemplifies that sports department’s utter collapse over the past decade-plus, has apparently already penned a missive speculating about what Goodell may have “covered up” 7 years ago. Please just shoot me now if this is going to be yet another Patriots season engulfed by media coverage of that non-story that should have died almost a decade ago. And seriously, the Globe needs to step off. OK, we get it. You Globies hate the Patriots, and you especially hate their “fanboys” — otherwise known as people who root for the local NFL team and wish to see them do well. Shank hates Kraft because he was denied a free breakfast at the Super Bowl in 1997 or 1998 (can’t remember the exact year). WE. GET. IT. So just cover the Sox, Bruins and Celtics and leave the Patriots and their fans in peace, would you please?